Lots of things can make us happy—big things and little things, serious things and funny things, lasting things and temporary things. But in our passage from Peter’s letter, Peter is not talking about garden-variety happiness. He’s not talking about the kind of happiness that depends on what is happening around us or on the objects or people that surround us. He’s not talking about a happiness that, even if it lasts a long time, is always temporary in the end. Peter is talking about a very special kind of happiness. He’s talking about joy—the joy that comes from our new birth into a living hope in Jesus Christ. In the secular world, the only difference between joy and the more day-to-day variety of happiness is the level of intensity. Joy is simply a heightened degree of happiness, intense perhaps but still temporary. It depends on one’s relationship to events or objects or other people—all things that can change or disappear or let us down. But Christian joy is something on a whole different level. For a Christian, joy is no less than happiness in our relationship with God. For Christians, the source of our joy is the assurance we have of the love of God and of our salvation through our faith in Jesus. Christian joy depends on one thing only: our relationship with our steadfast God, rooted and grounded in the love of God and our faith in Jesus. Peter’s letter is a powerful summary of the source and nature of Christian joy—our hope in the promise of the new birth which has already come to pass in Jesus, and in the hope for what is “not yet”: the fullness of salvation that will be revealed when Christ comes again. This hope is a “living hope,” one that is alive with possibility, not just for the end of our earthly lives but for how we live now. Our joy is rooted in God’s promise—our certain hope—and that promise is never changed by what happens around us. Our experience of Christian joy is dependent only on our acceptance of God’s merciful gift of hope through the resurrection of Jesus Christ, an inheritance that is imperishable, undefiled, and unfading. Surely this is reason enough to be joyful! Joy in God’s love for us is intimately connected with two other expressions of our faith: prayer and gratitude. When we experience a joyful relationship with God, it is natural to want to talk with God more often, to hear God’s voice more clearly, and to simply rest in God’s presence. Think back to when you first fell in love. Do you remember how exciting it was to hear your beloved’s voice on the phone, how you could hardly wait to spend time with them? (I hope you still feel that way, and that you feel that way about God!) Prayer is our way of expressing that feeling to God, of talking and listening to God and being in God’s presence. Retired Bishop Ernest S. Lyght once wrote, “Always celebrate the fact that the best thing that has ever happened to you is that you fell in love with Jesus.” Prayer is one of the best ways to let Jesus know how much we love him. Gratitude is the other way we express our joy in God’s love. What gifts we’ve been given: new birth, a living hope, and an inheritance that we share with Jesus as God’s children! Gratitude is a natural companion to the joy that springs from these gifts. We show that gratitude in many ways—in our prayers, in our service, and yes—in our offerings of money. It’s easy to fall into thinking of our offerings as dues that we have to pay be part of this church family, or a kind of gate fee or cover charge to get into worship, or just doing our part to keep the lights on. But, first and foremost, our offerings are an expression of our gratitude towards God for the gift of salvation and the indescribable and glorious joy that comes with it. These three things—joy, gratitude, and prayer—support and expand each other in an unending circle. Joy in our relationship with God moves us to spend time with God in prayer. Prayer gives us the opportunity to reflect on the blessing of Jesus Christ and makes us even more aware of the other blessings in our lives. This awareness increases our gratitude for God’s goodness to us. And gratitude for all God’s gifts leads us to back to joy—the indescribable and glorious joy that Peter writes about. The good news is that this joy can and does exist in the midst of suffering. Just as laughter occurs along with tears, and humor is joined to a serious message, joy and suffering can and do co-exist in the Christian life. We can experience joy in the midst of suffering because the source of our joy is our confidence in the unwavering love of God and our salvation through Jesus. It springs from the belief that no matter what the world throws at us, we are assured of God’s presence and love. Peter gets at this in his letter. It’s written to a group of churches who are all wrestling with what it means to live a Christian life in the midst of an unbelieving world. They probably weren’t suffering from the intense, systematic persecution that would come later, but their new-found faith in Christ is causing them some trouble and pain. They were being challenged for confessing Christ as their Savior and living according to his teachings. They were alienated from the communities they had been part of, including some of their families and friends. Confessing Christ as their Savior had led them into times of trial. Peter reminds them that while they wait for Christ’s coming again and the full revelation of the salvation promise, God is protecting and strengthening them. Through the power of the Holy Spirit, given to them—and to all believers—in the moment when we claim Christ as our Savior, they can stay strong in the joy of their faith. They can endure the trials that they face, knowing that those trials cannot touch the sure hope and promise they have been given, and the joy that results from it. Peter is writing to early Christians who were struggling, but his words do speak to us today, don’t they? We, too, face struggles and trials as a result of living out our faith in an unbelieving world. But we also struggle with how to understand suffering more generally, as it relates to our faith. Whether it is large-scale suffering in Syria or right here at home, we try to figure out what our faith has to say about suffering. Peter’s letter puts suffering into perspective. He says, “In this new birth and living hope you rejoice, even if now for a little while you have had to suffer various trials, so that the genuineness of your faith—being more precious than gold that, though perishable, is tested by fire—may be found to result in praise and glory and honor when Jesus Christ is revealed.” Peter’s words can guide us in our own efforts to understand what role suffering plays in our lives and in the world. This interpretation assumes that God sends trials our way on purpose to assess the genuineness of our faith. Although Peter doesn’t say it here, we usually couple that with an expectation that our faith will be made stronger and that we’ll learn some lesson. This interpretation says that it is God’s plan and intention that we suffer various trials as we wait for the full revelation of God’s kingdom, so that we can learn and grow in our faith. But there is another, equally valid way to understand Peter’s words, and this is the interpretation I believe is more in keeping with God’s nature as a God who loves us and wants only good for us. This interpretation says that God does not send trials to us in order to see how we’ll measure up. God doesn’t send suffering—to us or to someone we love—in order to teach us something. Trials and suffering, illness and loss, and all the troubles of this world come about simply because the world is a broken place. They come about not because God wills them, but because sin has taken its toll, and God’s kingdom on earth is not yet complete. But through all this, God is with us; we are “being protected by the power of God through faith.” We may suffer in various ways, but in the midst of our suffering, God is with us and will be with us until the fullness of salvation is revealed at Christ’s coming again. This is the foundation of the hope and joy that we have. Knowing that and demonstrating our trust in God by the way we live through times of difficulty, reveals our genuine faith to all who see it. Regardless of how we explain suffering in the lives of believers, faithfulness in the midst of it leads to one result. In the midst of suffering, the witness of the faithful during times of trial “will result in praise and glory and honor when Jesus Christ is revealed.” Joy, as it applies to Christians and the Christian life, is a mark of the faith we embrace. Our broken places and our faithful response of joy in spite of them become the evidence of our trust in God. There is a kind of Japanese ceramic work which is now considered an art form but was originally simply a way to repair broken pieces of pottery in a way that made them both useful and beautiful. It’s called “kintsugi.” It involves filling cracks or rejoining the broken pieces of pottery with gold. Kintsugi reflects Japanese philosophies that embrace what is flawed or imperfect and value signs of wear and use. 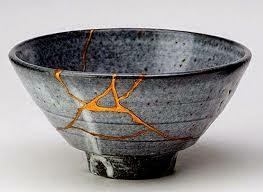 Kintsugi embodies the acceptance of change and brokenness as aspects of human life. Joy in the midst of suffering is a kind of kintsugi for our lives. The joy of our faith in God and in the gift of Christ’s resurrection promise, even during times of trial, is the gold that holds our shattered pieces together and fills our broken places. Joy in the midst of trial doesn’t ignore our pain or suffering, or try to hide them, but instead is a visible sign of our trust in God’s love for us. Joy redeems our trials by making them useful as a testimony to our faith in Jesus. It is a visible sign to others that our lives are anchored in our confidence in God and God’s promises to us. I have a dear friend from seminary who embodies the kind of joy that is founded on her confidence in God and in her relationship with Jesus. Claudine Leary is one of our United Methodist elders. Claudine’s life has not been an easy one. She is a native of Rwanda and was a refugee from the genocide there. She’s had 1st-hand experience with the toll war and ethnic hatred and disease can take on families and communities. Hers are experiences that you would expect to drive out any joy in someone’s life. And yet, she radiates the joy of knowing Christ as her Savior and friend. Her life is laced by the presence of a golden and joyful faith that fills and connects what evil tried to destroy. Hear again the promise that is the source of that joy: “By God’s great mercy we have been given a new birth into a living hope through the resurrection of Jesus Christ from the dead, and into an inheritance that is imperishable, undefiled, and unfading, kept in heaven for us, who are being protected by the power of God through faith, for a salvation ready to be revealed in the last time.” We have been offered the joy of this promise. It is the joy that results from our faith in the greatest gift of all—the salvation of our souls through Jesus Christ our Lord. May our lives and our faith be marked by this indescribable and glorious joy. Amen.